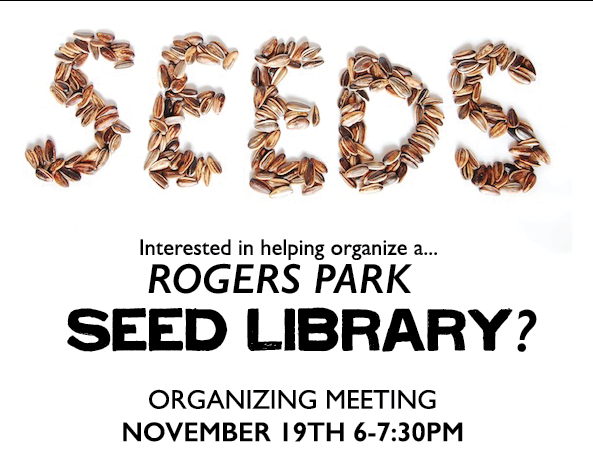 Are you interested in helping organize a Seed Library in Rogers Park? Then come to LETS GO Chicago’s meeting on Wednesday November 19th. We have received a grant from Shareable to build a library in the neighborhood and are looking for neighbors interested in helping design and run the project. Come learn more! A seed library, or community seed bank, is a collection of seeds which are made available to the public to promote biodiversity, heirloom garden varieties, and to teach about seed saving and starting. Seed library members “check out” seeds from the library to grow in their gardens. Some seeds that are saved from these plants are then deposited back into the library so they can be made available to more gardeners. Please email team@letsgochicago.org for questions or for more information.